Matt got a text a week or so before Christmas. From Amy, it said. "Can you get me some temporary tattoos for Christmas?" He thought this was just a bit odd but maybe she wanted them for a fun project for the kids in Jamaica. So he turned the town of Corvallis upside down looking unsuccessfully for temporary tattoos. And just a day or so before Christmas he found out that Steven has been using Amy's phone ever since she went to Jamaica. Emily has of course had A Christmas Carol on the brain, since the play dominated her life for the last three months. Like Bob Cratchit and Martha, she had to work on Christmas Eve but came home in time for supper. In our case, instead of a goose (or, as Emily says, "The goose! The goose! Yeeaahhh, the GOOSE!" [yet another ACC quote] ) we had our annual Kenyan supper in honor of Steven coming home to us seven years ago on Christmas Eve. But unlike Bob and Martha, Emily stopped at Fred Meyer after work. In front of the store she found someone giving away free kittens. She felt so sorry for them, trying to give away kittens on Christmas Eve, that she took one. Oddly, she felt sorrier for the people than for the cats. "I knew there was always room at our house for one more kitten," she said dreamily, like we are just such a loving and open and warm family, like the Cratchits. On the way home the kitty turned on the windshield wipers, landed on Emily's head when she hit the brakes, and pooped, but graciously right on a paper napkin. Since it's been here, the kitten has yowled. That's pretty much it. It yowls and yowls and yowls and tries to climb up the screen door and yowls and yowls and yowls some more. The girls wanted it inside but I said you have no idea if that cat has lice or fleas or worms or who knows what else. So it's outside with the other cats. It has food and water and a warm place to sleep. But it just yowls. I venture that even the Cratchits would have run out of warm, friendly, always-room-for-one-more feelings by now. Aunt Allene says she has barnacles on her skin. I am serious. She got a bad sunburn when she was a small child. They went to the coast and it was cloudy but she still got a bad burn, and now she has these rough barnacles on her face and back. I have never heard such things described in such a way before, but Smucker aunts have a way of putting things like you never heard them before. We all went to church together on Christmas morning, and the family obliged my cool-mom-fantasy by all sitting together on one pew. It was wonderful, all these amazing young people all in a row. But of course life never lets itself get too perfect, and the cost of my fulfilled fantasy was that a woman who innocently sat on the west end of the pew before most of us got there kind of got squished. Steven took notes on the sermon. He does this for his Bible class at school, I hasten to add, lest you get too impressed. He wrote down the preacher's name and the sermon title, then he whispered to Matt, "What's the date today?" "Dude. What is it?" Matt whispered back. Matt refused to tell him. Matt says it took 2 minutes and 38 seconds for Steven to figure out what the date was. Using a random number generator, the winner of the cd was comment number 22. We don't live far away. I'm going to try to try to find one of their performances. Thanks, Dorcas. 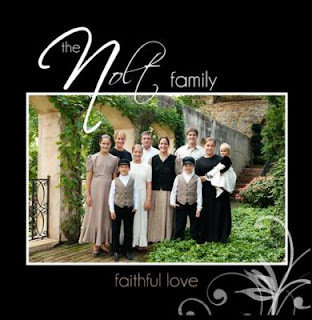 The Nolt family has a new cd and offered to have a giveaway for Life in the Shoe readers! Jewel Nolt, mom of this talented family, says, "It has banjo, piano, and guitar as accompaniment on some of the songs, and then we sing several a capella as well. You can listen to three of our songs on the Nolt Family Facebook page." My evaluation of their music: unusual and beautiful. Leave a comment if you want to be entered in the drawing, and I'll randomly choose a winner this week and Jewel will mail the cd. If you'd like to purchase your own copy, they are $14 each. Five or more are $12 each plus shipping. You can message Jewel on their Facebook page or email at jewinbunch@dejazzd.com. Or ask for it at your local Christian book/music store. Remember my post about my name? Ok, so a while back Amy subscribed to a sports magazine as a gift for Ben, and used my credit card, with my permission. In the sneaky way they do things, the magazine automatically renewed the subscription without telling us. Paul found it on the credit card statement. He called in. It was a bit confusing, I guess, because Amy had ordered it for Ben and Paul was calling, and he didn't realize it had been on my card. And of course they can't just take care of it; they have to verify everything down to your mother's shoe size without giving you any hints. I guess the guy on the other end, who won't get promoted to P.R. any time soon, decided to give Paul one hint: "It's this really weird first name on this account." "Uh, yes, I guess that would be my wife, Dorcas." Steven: How is that comforting? Me: Well, if you live, then you'll live, and if you die, you go to Heaven, so what's to be afraid of? Our church is going through some Serious Issues, which were on our minds as we headed for a church business meeting the other night. Me, to Ben and Steven: Ok, guys, whatever happens, I don't want you to get bitter about God and church. Ben: Actually, Mom, I think there's a lot more danger of YOU getting bitter than us. 1. "It'll all be mixed up in your stomach anyway." This is said in a cheerful voice as they scrape together mashed potatoes, jello, gravy, lettuce bits, ham, and ranch dressing--and expect you to eat it just as cheerfully. 2. "This won't hurt a bit!" or, almost as bad, "Just a tiny little poke..."
This also requires a cheerful voice. As Jenny says, "Most dumb things are said with a cheerful voice." You've had tetanus boosters and dental work done. They hurt. They didn't kill you, but they hurt. What's wrong with the truth? Like--calm, matter-of-fact voice--"This will hurt but not as much as skinning your knee." 3. "You're fine! Hop up!" And its corollaries, "Jump up!" "Don't cry!" "You're all right!" And my mother's favorite, "Hosht's meisly kfongga?" which means "Did you catch the mouse?" These are spoken by hyper-cheerful adults who look on when children trip and fall flat on their faces. One woman in my life was especially big on this when my kids were little. She thought I would teach them to be wimps if I helped them up and kissed the scraped knee. I always wondered what it would be like if SHE tripped and went sprawling on her face right in front of me, and I kept sipping my coffee and said cheerfully, "Hop up!! You're all right!!" Emily suggested this entry. Her explanation: "This is when something is legitimately unfair and your parents say, 'Life isn't fair,' and it's like, 'Duh. You could make it fair. Right now. You have that power." I contend that "Life isn't fair" is justified when it's all out of your control and there simply is nothing else to be said. 5. "The starving children in Somalia would be so happy to eat that." A Smucker offspring suggested this one, too. I'm guilty as charged. Parent's perspective: If these picky children only had a CLUE of what the rest of the world endures they would clean their plates with gratitude. Child's perspective: So, send these peas to Somalia if you're so worried about little Somali kids. Ben: So when I go to Bible school, how often will I be expected to communicate with you? Me: Once a week, at least. December's column is about gifts--those given, those withheld, and those given instead. Jenny: It's so gross. Mom coughs in her hand and then she DRIVES. Her steering wheel is like COVERED with viruses! Emily: So? It's Mom's car. Paul: How long do viruses survive on a dry surface? Me: Half a day I think. Ben: So is it viruses or bacteria? Me: Everyone's exposed anyway. I mean, I've been touching doorknobs and coughing and breathing around here for over a week. Me: Well, I'm trying to quit breathing, because it triggers my asthma. Jenny: Wouldn't that be cool if you could breathe through your skin? Ben: That would be annoying, because when it was cold, you could only breathe through a little part of your face. Oh wait. That's how it is normally. I am sick again, with the Bubonic plague or something like it that began a week ago with a sudden sore throat that felt like an acetylene torch had blasted at my tonsils. It has now morphed into the most wretched cough you can imagine, involving great loss of sleep and throwing up of breakfast and other terrible results. My only comfort is that about every third person in the valley has the same thing, including a few strong men in this household who seldom succumb to colds. I reek of garlic and other potions. Jenny walked by and said, "Mom, what do I smell?" I said, "I smell like That Lady That Uses Essential Oils." Jenny said, "Oh yeah. You do." I like the smells of essential oils, really, especially if they work. I've spent too much time huddled up in the office chair, clicking around online, because it was easier than anything else. This was interesting, about Tim Tebow. NFL quarterback is a position best played by young men who were raised by strong fathers. Quarterback is the ultimate leadership position. You have to be taught how to lead. You have to be taught how to prepare. Yay for all the men out there who stay with their families through all the tough times. And No, I don't have a mom-crush on Tim Tebow. Well, not really, that much, beyond thinking wistfully that he is very close in age to Amy and Emily, and he just seems so NICE. And if he married either Amy or Emily and the house were on fire he could pick up his wife and tuck her in his elbow like a football and run outside and save the day. And Amy could discuss football with him over breakfast like she did with that one guy on the plane one time who couldn't believe that this little Mennonite girl knew that much about dual-threat quarterbacks and possession receivers or whatever technical stuff it was. Saturday I dragged myself to a book signing because I had promised the lady I'd be there. Her name is Amanda Bird and she has a little book shop called The Book Nest (clever) in the antique mall on the south end of the big building just south of WinCo and McDonalds in Springfield, where the Teen Challenge thrift store used to be on the north end. There were about five other authors there. One of them is named Laurie, with a long Iranian last name, and she wrote a book about her daughter with autism. Laurie's mother is none other than Marcy Tigner, the lady with a little-girl voice and a ventriloquist's dummy named Little Marcy, who produced dozens of "Marcy and Little Marcy" children's records back in the day. If you are Of A Certain Age and grew up Christian but not too Plain, you know exactly who I'm talking about. Laurie says a lot of Marcy's success was due to her husband, who loved to promote her, and who would breeze into town and call the radio station, the bookstores, and I don't know who all else to set up appearances for Marcy. I think she thought our little book-signing venue could have used some of her dad's flashy expertise, but really it was well-attended, considering. And, if you're interested, Laurie has a stack of old/new Marcy records in her garage that she'd like to sell. Here's a link for Marcy. And then we have this story. I have my issues with the UN. Among other things, when they go into a country to do all their good deeds they refuse to collaborate with missionaries, even if they've been there for 20 years and are fluent in the language and know the local culture. No no. Missionaries are evil. So they go in and spread their good deeds in the most culturally offensive way and where least needed, because after all, they know best. Then there was the time Canada had a general election and the UN sent a representative to the reserve we were on to make sure the First Nations people were well educated and informed regarding this election. Well, was there the slightest chance the crusty old Lazarus Kakegamics and Jowin Quequishes of Weagamow were interested in what this greenhorn had to say? No there was not. So he spent about three days fishing from the airplane dock, as I recall, and had one evening session at the band hall to inform the ignorant populace about the election. But worst, far far worst, is the UN's policy on adoption. They feel that country of origin takes precedence over everything. And they put a lot of pressure on third-world countries to quit adopting internationally. Which means that way way too many children get to live in third-world orphanages rather than with moms and dads in a different country. But if they survive to adulthood, we can be assured that these orphans are oh-so-grateful to be culturally intact and whole. Now before I get any more political I will share something I found in the archives. I had written it in a form letter to family and friends years ago, and our friend Dave Hertzler reprinted it in Today's Native Father. I think Matt was about 11 years old here, and Amy 9. Matt and Amy have slept outside in sleeping bags quite often. One night there were supposed to be lots of shooting stars, so they wanted me to come out and watch the sky with them. They settled down in their sleeping bags, and after a while I bundled up in winter wraps and joined them. I have long suspected, and now know for sure, that my children win all the prizes for being competitive. Me: Ahhh, what an awesome universe. . .
Amy: I saw it too! Matt: Now I have 21. I'm still ahead of you. Amy: And I have 19. Me: (sigh) Why can't you just enjoy these stars without being so competitive? Amy: We're not comPETTING! We're just keeping track. That's what makes it fun. (pause) There's one! Now I'm only one behind you! Matt: I saw it too, I think. Amy: Was it a light one over by the pine tree? Amy: I don't think you saw it because I saw it AFTER you last said, "There's one." Me: If you two don't stop this now, I'm going back inside. Matt: Ok, I guess I can stop. Me: Amy, WHAT are you doing?? Amy: If I can't count them I might as well go to sleep. Amy: (interrupts) You can't say seeing shooting stars is one of them because I WAS ahead of him!! I think the conversation began after a hot lunch I served at school. My friend "Twila" showed up to volunteer in the classroom, but first she helped me serve the food. "If I could, I would start a coffee shop in Harrisburg," she said. She had it all down--the baked goods, the decor, the clientele. All she needed was the time, the money, and a few other small details. I've found that most of us go around with an "If I could" idea in our heads. Emily has a similar idea for a shop in Harrisburg. She even has the place picked out, an old empty brick building with an arched front, a little courtyard behind a fence, and a tiny attached house. She calls it "Whispering Winds" and went so far as to have a real estate agent give her a tour of the place. She's a bit vague about what services or products she would actually offer there. Also, she lacks a few small details like time, money, and being able to be in two places at once, since she wants to go on the mission field after college. I told Twila that I also have an "If I could" for a business in Harrisburg, and that is a fabric/paper/tea shop. In addition to the normal quilting cottons I'd have a stash of fabrics that a person would actually wear. I'd have a comfy chair and coffee and Outdoor Life magazines for waiting husbands. And in the back I'd have a room for my Fabric Exchange, where you could bring in fabric from your stash and get so many points based on yardage and quality, and then you could pick out what you wanted, for similar pointage, from the stash that others had contributed. I wouldn't get anything out of it but I think it would be fun. Also, with Emily working at Grocery Depot, I've been thinking that there just has to be a whole hidden industry out there of damaged and outdated fabric just like there is for bent-n-dent lotions and canned vegetables. How do I tap into that delightful river, I wonder? I haven't thought out the paper and tea part as well, especially since I don't see myself baking scones and other dainties to sell. Maybe I'd just brew a pot of tea and sit down with customers and let them sip free tea while we talk. All that stands in my way is . . . everything. Someday when Emily is out of college and Twila's and my children are all grown up and I figure out how to be organized, we'll all have to collaborate on the Perfect Business in Harrisburg. I have an even bigger "if I could" and that is a house at the coast. It would be on the west side of Highway 101 so you could take children to the beach without crossing that busy road. It would have lots of space for big families or groups. Our family could go out for brief retreats from real life, Paul and I could go there for time alone, and Emily and I could go there for a week at a time to work on our novels. We could use it for Bible Memory Camp, Ladies' Retreat, and the annual Youth Coast Trip. We could rent it out for a reasonable price to Mennonite families who always have a hard time finding a place both large and affordable and who could be counted on to clean up after themselves. Most of all, I could offer it free to missionaries on furlough who desperately need rest but could never afford to rent a place. All that stands in my way is a million unsold books and free weekends to drive out and keep the place up. Meanwhile, I wonder, what is the "If I could" floating around in everyone else's head? Jenny: [sitting on her bed one night, solemnly pronouncing] You know, I'm not that interested in bugs any more. Jenny: I'm not gonna be an entomologist. Jenny: [suddenly noticing picture of butterfly on her pillowcase] Oh my goodness!! It's a swallowtail! An eastern tiger swallowtail!! !